Chekhov perfected the short story, as shown in these three moving miniature dramas of love, dread, and lies. These three short stories were excellent. All touching on humanity's quest for happiness, the importance we place on love, and the ability we have to deceive each other; they were stirring, and quite impressive. The Kiss was definitely my favourite. In a darkened room, a soldier is kissed by a woman mistaking him to be her lover. The joy this brings to the soldier is immeasurable, and he begins to invent situations in his head, of love and marriage, despite never having seen the face the kiss belonged to. He is soon plunged into an melancholy, as he realises the scenes he's created in his mind will never come to pass. His feelings are beautiful and heartbreaking all at once, and Chekhov's commentary on the fatalities optimism and hope can bring, is devastating. The Two Volodyas tells of Sophia, who married for money. Meeting an old friend who, despite a prior life of immorality, has converted to life in a convent, she mourns the friend's loss of life, living in an oppressed and dull dungeon. Soon after the meeting, she begins to realise her own life is much the same, and she reverts to affairs and debauchery, understanding her greed has not brought her happiness. Gooseberries is absolutely the most dismal of the three. A man tells the story of his brother, whose life's ambition was to live in the country in a grand house surrounded by gooseberry bushes. Once he has achieved this goal, the man visits his brother and becomes aggrieved at the superiority of his happiness. This being told, the narrator pontificates on the meaning of happiness - how can one be happy when so many others around the world are suffering? To be happy, we must shut out the misfortunes of others, and pretend they don't exist. It's thought-provoking; the brother worked hard all his life in order to pursue his dream, now he has it, he should not be allowed to enjoy it because of the world's sufferings. Can he single-handedly stop these sufferings, however? He can't. So should he be allowed to be happy, despite the deprivation of others which he's unable to control? Such questions. It reminds me of the feeling that occurs when something traumatic happens in our lives. After the loss of a loved one, you see others carrying on with their lives in the same way as they usually do. You wonder how they can be do audacious as to do so; you cannot believe they're completely unaware of the grief you're experiencing. How dare they? 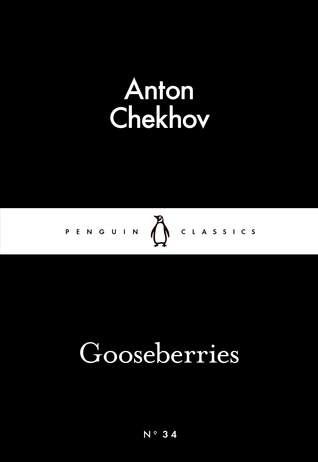 An excellent first experience of Chekhov; his commentary on the human condition is timeless, as is his ability to relate the complexities of life. I found this is to be another success story of the Little Black Classics range, and long may it continue.